The first week after a move is the hardest. The stress of packing and unpacking the moving van (twice), the long hours finding space for belongings in unfamiliar cupboards and drawers, the uncertainty of where to buy everyday items, like groceries or end tables. It is both intimidating and exciting. Over the course of the summer, I went from a small town of 3,000 to a big city of over 3 million. The change hasn't sunk in for me yet. Besides a handful of necessary errands, I haven't had the chance to leave the apartment and explore the new neighborhood. I am no stranger to moving—I have lived in eight cities in three different countries throughout my twenties—but every move brings unexpected changes and emotions. Time must pass before the foreign becomes familiar, and you feel ready to call it home. I have gone out to buy pantry essentials twice—the eggs were forgotten, and then the baking powder—but my cupboards still feel bare. After noticing the only item in overabundance was the fruit bowl, I set out to create a simple dessert that would accompany everything from the nectarines to the red and blue berries on the counter. Pound cakes are the clean slate of cakes, relying on the topping to create the excitement. Though pound cakes are traditionally made with butter, olive oil can create a cake with a comparable texture and flavor (especially if butter is another pantry staple unintentionally overlooked). Using a high quality olive oil will give you the best results. A light extra virgin olive oil gives a taste most similar to butter, but a herb infused oil or other distinctive flavor will create a unique final product. I suggest topping it with coconut whipped cream and fresh, seasonal fruit. Though pound cakes are perfectly delicious sliced and served, they can also be grilled or coated with butter and fried like a grilled cheese before topping. The choice, as always, is yours. 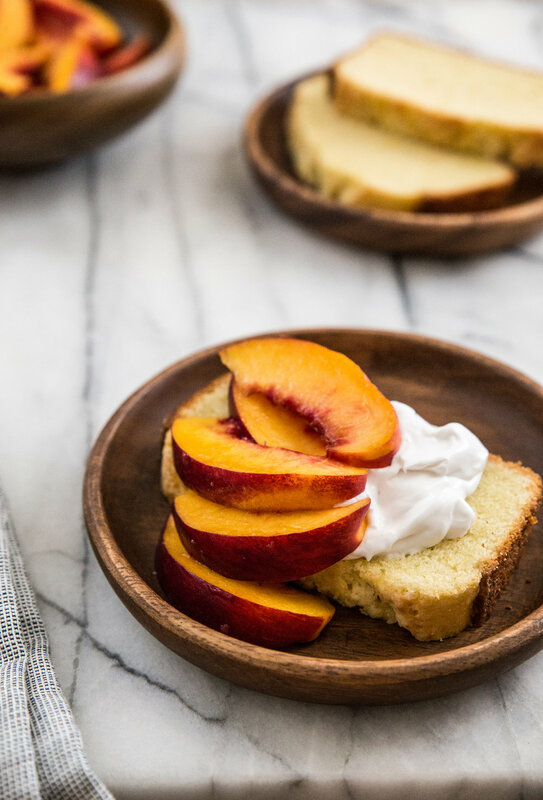 Olive Oil Pound Cake is a great accompaniment to seasonal, ripe fruit. The cake is infused with lemon and orange zest, which gives the cake a subtle citrus note, but is not a primary flavor. The type of olive oil used will have the greatest influence on the taste of the final product. Choose a strong or neutral tasting oil based on your preference for the cake flavor; if uncertain, use the olive oil you already have in your home (you know you already enjoy it). In a large mixing bowl, rub the sugar, lemon zest, and orange zest between your fingers until fragrant. Beat in olive oil. Add eggs one at a time, beating well after each addition. Continue beating the mixture on high for 3-4 minutes to add aeration to the mixture. Beat in the vanilla, baking powder, salt, and lemon juice. Add 1/3 of the flour and beat at a low speed until blended. Add 1/2 of the milk and continue beating. Repeat additions by adding 1/3 of the flour, the remaining milk, and the remaining flour. Pour batter into prepared pan and bake for 45-55 minutes, or until golden and a toothpick inserted into the center comes out clean. Remove from oven and, after 10 minutes, transfer cake to a cooling rack to cool completely. Serve with fresh fruit and coconut whipped cream.